Alligrator Milling Systems provide alternative solutions for milling and pulverisation. The Alligrator comes as a complete milling system, requiring only the connection of the electrical supply, and the ancillary equipment (packed inside the shipping container) to begin production. 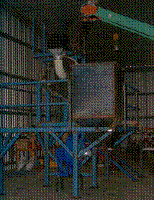 Systems such as this portable unit ensure fast setup times when used for refugee type applications or when disaster strikes and a need for flours or milling is required. All the feeders, augers etc are loaded inside the container and assembled when landed on site. The System uses the container as a housing and operates within. Everything that is directly needed in the milling process is included in the system, items such as dust collection, raw material input feed conveying and product exit augers. The supply of a complete system simplifies installation, maintenance, warranty arrangements and provides the ability to fine tune the entire process. The "System" is controlled via a PLC (Programmable Logic Control), which provides a simple and effective stop/start operation without the need for an experienced operator. This level of control maintains maximum operation parameters and efficiencies at all times. This also allows for integration with other processing equipment. A 1.5 MT per hour system uses a 55 KW drive motor. 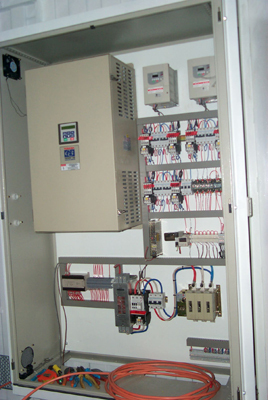 Electrics are available in 50 - 60 Hz (415 - 480 Volt 3 phase power supply) applications. The Alligrator Mill System is unique in principle but incredibly simple in application. The unusual aspect of this system is that it is like having two mills in one, it is a material on material impactor, which also has a grinding capacity. This gives a more complete and finer grind in one pass. The maximum size of input material is 25mm. The Alligrator Mill System is a high-speed, wind-swept impactor with only one moving part. Pulverisation is achieved by material to material impact with hammer speeds of 100 metres per second and accelerated particle speeds of up to 200 metres per second, and an adjustable anvil. This action occurs within an artificially induced vortex which, by nature of the shape of the mill, causes size reduction without the use of screens. The robustness of this mill allows for uncleaned wheat to be milled and produce a high grade of wholemeal flour. Product temperature is on average 4 - 8° Celsius above ambient. Air conditioning and chilled water cooling of the mill housing and bearing oil can be provided, when even lower operating temperatures are required. Low temperatures and no internal screens, ensure products flow freely through this system, even high oil content products such as soya beans, can now be milled easily, without prior steaming and drying. Because of the energy efficiency and compact size of the Alligrator Mill System, the entire processing system can be contained in one small sealed tower. Compact size, the sealed tower and new and efficient Nitrogen generation means that, for the first time, it is possible to create a viable "Oxygen Free"* milling and packaging environment. This process eliminates rancidity, which is a major health problem and also provides a much longer shelf life. "As fresh as the moment it was milled" will be a reality. The Alligrator Mill System is small and efficient, an entire 1.5 ton per hour milling system can be installed into, and operated in a 20 foot shipping container. A 'Food Relief' version has been produced for Food Aid relief groups, Governments and Humanitarian agencies. The System ancillaries pack completely inside the container for transport. Once delivered, the complete system takes less than one hour to assemble, ready to produce flour. The only other requirement is a generator or mains electrical supply. A fully accessible entry door exposes all the internals of the mill, allowing for easy and fast hygienic wash-down, enabling compliance with rigorous Food Grade and Organic Certification standards. Floor space is a major cost saving factor when using the Alligrator Milling System. A 3 tonne per hour system mounted in a vertical processing tower complete with all the ancillary equipment, including raw product delivery, screening and packaging, would have a footprint of only 16 square metres. A complete system capable of processing 1.5 tonnes per hour can be mounted and operated within a twenty foot shipping container. This has major implications for food relief operations. So far, three sizes of mills have been designed: 150 kilogram per hour, 1.5 tonne per hour and 3 tonne per hour. 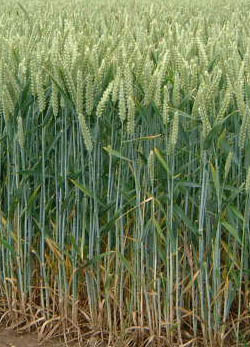 These ratings are based on hard wheat and would vary depending on product density. This makes these mills perfect for niche applications in specialty foods processing. A 150 Kgs per hour mill system and a 15 Kgs per hour Laboratory mill. 1500 Kgs per hour containerised mill system. The Alligrator Milling System can mill an extraordinary range of different products, from nutriceuticals to organic raw sugar; all using the same mill, with no modifications required. There are no costly pre-treatments such as steaming and drying for oily products like linseed or soya bean. Products such as herbs and spices, grape seeds/skins, dried kangaroo meat, pharmaceuticals, cosmetic clays and many more can be milled to a fine powder and in a single pass, without losing essential oils and aromatics. Organic raw sugar high in molasses content is easily milled into icing sugar without any problems. The Alligrator Milling System can mill an extraordinary range of different products, from nutriceuticals to organic raw sugar; all using the same mill, with no modifications required. There are no costly pre-treatments such as steaming and drying for oily products like flaxseed or soya bean. The Alligrator Milling System sets a new standard in diversity. The term "difficult milling characteristic" is seldom associated with the Alligrator, as most foods mill easily using this system. When almost any foods can be processed, using the same equipment, the ability to diversify a business or product line is a far simpler operation. Diversity provides the ability to pick & choose your product range according to availability, market demand and profitability. Now a healthy choice is available to processors and consumers alike. Automated and synchronised operation, reducing the need for supervision and skilled labour. Compact design allows for minimal floor space. Low shipping costs. 20ft shipping container. Product feed rates are completely variable. Equipment is mobile and modular. Process does not generate much heat. Wide variety of grains/products can be processed. Current food processing technology is now dated by over 100 years. A quantum leap in food processing will enable innovative food processors and manufacturers to be years ahead of their opposition. Manufacturers who can commit to the functional food sector with innovative and customized products are now going to be winners. The restrictions faced by milling equipment sales companies are that they all offer the same restrictive equipment and have done so for many years. They all offer what is available today and they do it very well, but when the market changes or technology progresses, can they move with the times? What do they offer that is new? None of them can cater for the diverse range of materials, varying throughputs and delicate natures of products supplied by the organics industry. The supply of these healthier foods will have to keep pace with demand. Existing infrastructure cannot keep pace with either the quantity or quality of the foods being demanded. Whether it is to the farmer or to the processing factory operator, the Alligrator provides many opportunities and solutions for the problems facing the food industry today. How do you service the changing market of tomorrow with the rigid equipment of yesterday? The small physical size of the Alligrator Milling System allows the entire system to be used in an "Oxygen Free" milling/packing process contact us for details (link to sales contacts) where rancidity is not initialised during the milling process, and allows for extended shelf life of products without additives. Research indicated that most companies today do not have a permanent engineering division as was the case a few years ago. Our company took the initiative, and designed our milling system as a basic "plug in and work" type system. To our customers, this means fast and simple installation procedures where our trained commissioning team assemble the system, connect to mains power, (or a generator if in a remote area) connect the raw material feed conveyor, and the product out feed, and the equipment is operational. Using our own integrated dust collection system means no fugitive dust, no guess work trying to connect an external dust collector, and allows the fines to be used as product if required. The Alligrator Milling System utilizes variable speed drives in the main mill drive motor, in the feeder drive motor, and in the dust collector extraction fan drive motor. These variable speed drives reduces the start up current significantly on mill start up and saves severe shock loading on components unnecessarily, as well as giving operational variability. The feeder drive and the mill drives are linked via a PID loop to allow constant adjustments to be made to the feeder rate based on mill motor loading to ensure constant mill loadings are maintained without overloading. 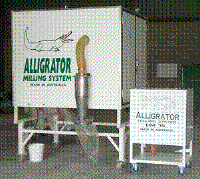 Alligrator food mills are available in 1.5 tph and 3 tph systems.